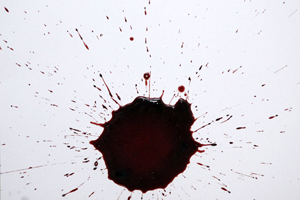 After several years of discussion and debate, the Scientific Working Group for Bloodstain Pattern Analysis (SWGSTAIN) has released its recommended terminology list. The menu on the right lists the SWGSTAIN terms from the recommended terminology list. When you select a term from the links at right, the SWGSTAIN definition will be at the top of the section with an example image of the term shown below if appropriate. A description of the image is given below, followed by alternate terminology. The majority of the images were created in a laboratory setting with fresh human blood. For the larger volume stains, sheep blood mixed with an anti-coagulant and a preservative was used. The images are meant to serve as a general example to exhibit the characteristics of the bloodstain patterns. Some bloodstain pattern analysts have created their own classification methods. In Bloodstain Pattern Analysis: With an Introduction to Crime Scene Reconstruction, Tom Bevel, and Ross Gardner use a taxonomic classification system where the main categories are The Spatter Family, The Non-Spatter Family, and Complex Patterns. In Principles of Bloodstain Pattern Analysis: Theory and Practice, Stuart James, Paul Kish, and Paulette Sutton have used the categories of Passive, Spatter, and Altered. In Bloodstain Pattern Evidence: Objective Approaches and Case Applications, Anita Wonder provides a flow-diagram to assist in classifying bloodstain patterns where the main categories are Spatter Groups, Spatters Not a Criteria, and Composites.